The old mantra, ‘location, location, location’ is not just about buying houses – new locations can inspire our creativity. This is no different for artists and painters. So, here is our guide to the benefits of a painting holiday. We all get excited when we are about to embark on a holiday, especially if it’s a place we have never been to before, but if you have a passion for painting why not combine the two? A painting holiday has a lot to offer painters at all levels. If painting is an outlet to an otherwise stressful life, then a painting holiday kills two birds with one stone. Or if you are looking for a new landscape to paint, then why not consider a painting holiday? In a recent blog post, we have talked about the mental and psychological benefits of painting. Nothing gets the creative juices flowing more than being inspired by new surroundings. Let your eyes wander and picture what you want to paint. Being somewhere new not only poses challenges, but can lead to wonderful new discoveries. Italy is a particularly good place to paint, and its landmarks, architecture and landscape have inspired artists for centuries! 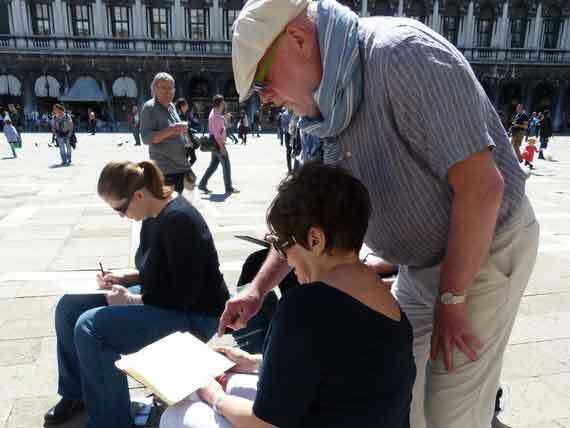 Step into the shoes of many an artist and paint the Grand Canal in Venice, or capture the Tuscan landscape in a new light – the options are endless. We all need new stimulation, so take some time to sketch, develop your ideas and collect your thoughts on paper. Painting in a new light often brings new challenges. This starts with your palette. Depending on your new location, your palette could be more blues if you are by the sea, or more green if you are in the countryside. Developing your use of colour, and learning how to step away from your comfort zone is what you can expect from a painting holiday. This is the exciting consequence of painting in new surroundings. Exploring new places means viewing things with a new perspective. Imagine you are in a small fishing village in Sicily, the sun is high in the sky and there isn’t a cloud in sight – you notice the contrast between light and shadow is outstanding. This has captured your imagination! So, you sit down to paint the contrast between the blue harbour and the old stone buildings. The light is strong, and the shadows are short and deep. There are challenges of shifting light, and how best to capture its transition. You wonder how best to mix the blue of the sky? This is the kind of scenario a painting holiday throws at you, and it’s exciting! A painting holiday offers a unique learning experience. Immerse yourself in a week long course surrounded by a new inspiring environment. With an expert tutor on hand, a holiday together with like minded people could really be beneficial – learn from others, sharing ideas, discuss new techniques. A week long holiday gives you the opportunity to get into a ‘flow’, and work on a series of paintings. This is the huge benefit of dedicating a holiday to painting somewhere new! So what can you expect to learn while on a painting holiday? 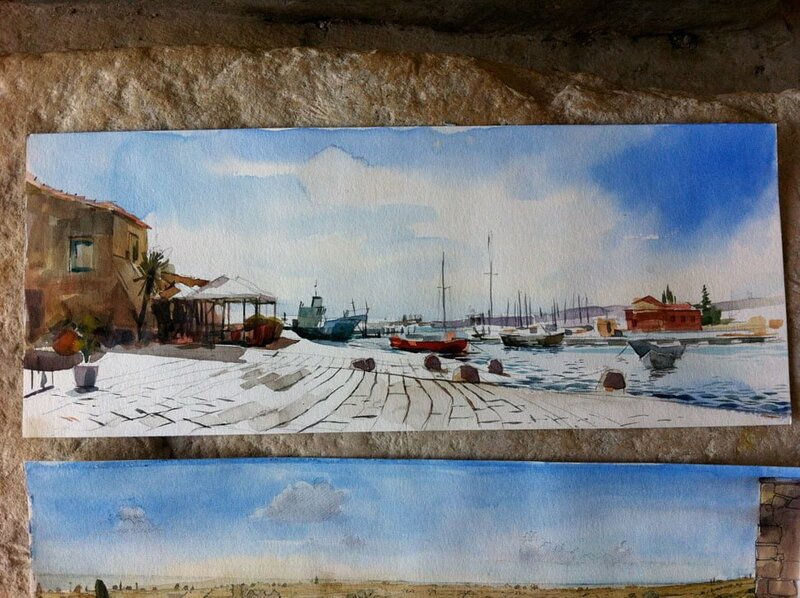 Hugh Tuckerman, a painting tutor with Flavours Holidays explains the positives. “I will guide you through the week, offering advice and tuition in order to improve your technique, understanding and increase your passion for painting. I concentrate on adapting my teaching to the abilities and experience of each individual. I believe it is important guests enjoy their holiday while developing their painting skills. One of my mantras is “it is only a piece of paper”. We all take photographs on holiday to capture a moment in time, but how many of us bother to print photos or make albums anymore? A painting holiday offers you the opportunity to travel and create your own lasting and physical memories on paper. This can be in the form of finished pieces of work, or a detailed sketchbook which acts as a diary for the week. This is your chance to record some beauty in your life and paint things that make you happy! The aim of the holiday is to create artwork that you can be proud of and frame. It is these types of artistic mementos that will be yours to keep forever. There are some real mental benefits to painting, and the hobby can be a great way to relieve stress and relax. It helps you reconnect with your creative side, and this is particularly true if you are picking up painting again after a long time. When you draw, you enhance your memory. By slowing down and observing carefully, you create deeper and more vivid records of everything that surrounds you. If you make drawing a habit and develop your skills, you’ll probably surprise yourself. A painting holiday serves as a distraction to everyday life and gives some balance in your life. It allows you to get into a flow and focus your attention on the job at hand. We all deserve some time for ourselves and if you have a creative streak, a painting holiday could be just what you are looking for. Flavours have Painting holidays to Amalfi, Bologna, Puglia, Sicily, Tuscany, Venice and Andalusia. Which city do you feel will inspire you most?